Gymreapers Provides Premium Quality Knee Sleeves & Other Forms of Weightlifting Equipment. Created by athletes for athletes. We tested and ensured the design for the perfect fit without sacrificing comfort. Competition grade 7MM Neoprene with reinforced stitching for long lasting durability and quality. Refer to custom size chart for sizing information. 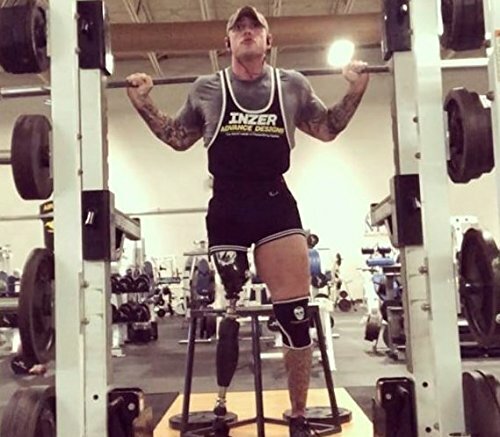 Perfect for all forms of athletic performance and fitness workouts: Powerlifting, Weightlifting, Bodybuilding, Cross Training, MMA, leg training exercises. Why are our knee sleeves a must have for any beginner, intermediate, or advanced fitness addict? The 7MM neoprene compression will enhance performance, prevent injury, and improve mobility. Instantly assist in preventing knee injury and relieving joint paint (ex: tendonitis, surgery, ACL tear) with the enhanced orthopedic support from our knee sleeves. For your comfort, the Neoprene material retains heat to reduce muscle stiffness - this warming affect improves mobility and keeps joints healthy. Roll the knee sleeves to your shins for skin protection for exercises like deadlifts, RDL's, and box jumps. Order in confidence, your order comes with a 60-Day No Hassle Return Policy and a 1 Year Warranty - 100% Guaranteed - No Questions Asked. Don't hesitate, join the movement and add our knee sleeves to your cart to protect your knees and push you to continue breaking PR's. FINALLY: A STRONG AND DURABLE KNEE SLEEVE FOR RESULTS ORIENTED ATHLETES: Gymreapers Knee Sleeves Were Created Through Strenuous Product Testing, Research, And Experience To Produce The Most Effective 7MM Neoprene Knee Sleeve Pair To Increase Knee Support, Improve Athletic Performance, Prevent Injuries, And Much More. STOP KNEE PAIN & PREVENT INJURIES - Gymreapers Knee Sleeves Are Made With Reinforced Stitching & 7mm Neoprene Material. The Compression Effects From The Knee Sleeve Pair Works To Stop Knee Pain, Warm The Patella Joint, And Prevent Potential Injuries While Maximizing Mobility. Workout In Confidence Without Nagging Knee or Joint Issues. 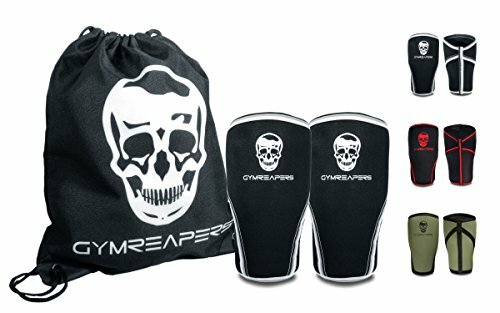 #1 MOST EFFECTIVE PAIR OF KNEE SLEEVES: Gymreapers Knee Sleeves Are The ONLY Popular Compression Knee Sleeves With A FREE Carrying Gym Bag That Can Be Used For Weightlifting, Powerlifting, Squatting, Cross Training, Olympic Lifting, Deadlifting, Snatchs, Cleans, And A Variety Of Other Athletic Activities. 5 STAR CUSTOMER SERVICE & QUALITY- Discover why our customers rate Gymreapers #1 in customer service and product quality. Our products are backed with a 60-day hassle free return option. Try them risk free today! 60-DAY 100% MONEY BACK GUARANTEE & 1 YEAR WARRANTY - Try Our Pair of Knee Sleeves Completely Risk Free! Return Even After You Try Them! We're So Confident That You'll Love Gymreapers knee Sleeves That We'll Refund Every Penny If You Don't Like It! If Anything Happens Enjoy Peace Of Mind With Your 1 Year Warranty. What Do you have To Lose? You'll Either Add Knee Support And Increase Performance, Or You'll Lose Nothing.